Russian computers that control the international space station's orientation and oxygen and water supplies were partly working again Thursday after failing the day before. Flight controllers in Moscow were able to re-establish some communication with the computers overnight, and Russian engineers were working Thursday to restore the rest of the system, NASA space station flight director Holly Ridings said. "They've made a lot of progress," she said. "There are some cleanup steps to do still and some investigation." Officials with NASA and the Russian space agency still do not know why the computers went down. They had never seen that type of failure on the space station before, and they believe it may be related to electrical power rather than computer software. A new solar array had been unfolded outside the station Tuesday to help provide power for the orbiting outpost, and astronauts spent Wednesday hooking up a joint that will let the solar arrays track the sun. The crew got a scare early Thursday while the computers were being reconnected: A false fire alarm went off on the Russian Zarya module, but Ridings said there was no indication of any fire or smoke. Atlantis is still docked at the space station, so the astronauts periodically fired its thrusters to help maintain the space station's position while the computers were down. NASA had said it might have to extend the shuttle's mission because of the problem; the mission already had been extended from 11 to 13 days to repair a thermal blanket that peeled up during launch. In a worst-case scenario, NASA said, the space station's three crew members might have to return to Earth early if the computers aren't fixed. 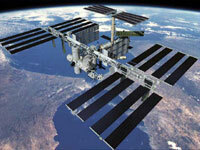 Without the Russian oxygen-machine running, the space station has a 56-day supply of oxygen left. The space station is operated primarily by the Russian and U.S. space agencies, with contributions from the Canadian, European and Japanese space agencies. During a spacewalk on Wednesday, astronauts Patrick Forrester and Steven Swanson started to bring to life a rotating joint that will allow the new pair of solar arrays to track the sun. They also helped retract a 115-foot (35-meter) wing of an old solar array that will be folded up into a storage box and moved to another location later this year. Only 13 of the array's 31 sections were folded up, so flight controllers and astronauts will try to fold up the rest of the solar wing by remote commands on Thursday. NASA managers decided Wednesday to use a spacewalk on Friday to repair the torn thermal blanket, located over an engine pod near the shuttle's tail. The astronauts will secure the blanket using staples from the shuttle's medical kit and loop-headed pins from its tile repair kit. If those methods do not work, NASA flight controllers will have the astronauts sew it into place using a stainless steel wire and an instrument that resembles a small needle. Engineers do not think the damaged section of the thermal blanket, which protects part of the shuttle from the blazing heat of re-entry, would endanger the spacecraft during landing. But it could cause enough damage to require schedule-busting repairs. NASA has focused intensely on any problems that could jeopardize a shuttle's re-entry into Earth's atmosphere since shuttle damage resulted in the 2003 Columbia disaster that killed seven astronauts.